Start date and end date: The first and final dates for which the model should be run. Output areas: Two options are currently available: Local authority areas and 1km grid. These select the spatial units of the model calculations. Include QF components: The components of anthropogenic heat flux for the model to include in calculations. Output path: A directory that houses model outputs. 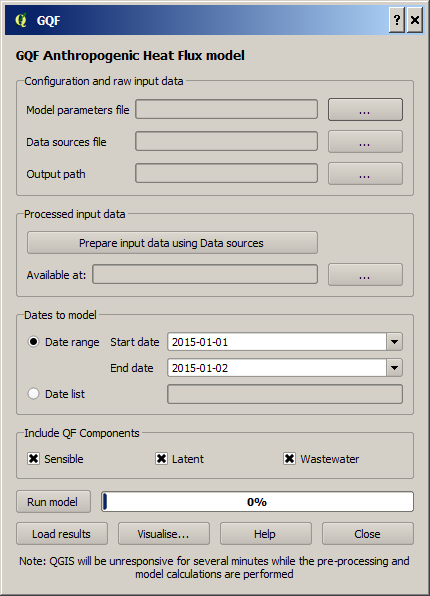 The total anthropogenic heat flux for the first time step is displayed in QGIS to demonstrate model output and the output areas. In order for these areas to be displayed correctly, the coordinate reference system must be selected. The QGIS “Select CRS” screen will appear, and EPSG 27700 (British National Grid) must be chosen. The layer displaying model output also contains the other contributions to QF (e.g. car transport). These can be visualised using standard QGIS methods of styling the layer according to the selected component, or inspecting the layer attributes table. A “pickled” Python data object containing the results is also saved in the local temporary folder for future use with other UMEP components.